Thermo-optic analysis involves predicting the changes in optical performance due to the refractive index changes caused by changes in temperature in transmissive optics. As shown in Figure 1 SigFit takes temperature profile predictions from a thermal finite element model and thermo-optic material properties and is able to make thermo-optic predictions using two methods: the OPD integration method and the user defined gradient index method. The first method of thermo-optic analysis is to perform integration through the finite element model to compute optical path difference (OPD) along integration paths. These integrations result in OPD maps that may be placed on the optical surfaces of the optical analysis model through a macro file written by SigFit. Figure 3 – The OPD integration method of thermo-optic analysis generates OPD maps importable to optical analysis. The second method of thermo-optic analysis in SigFit generates input for the user defined gradient index lens capability in the optical analysis. In this technique SigFit generates a three-dimensional representation of the disturbed refractive index profile to be used in conjunction with a dynamic link library provided with SigFit to allow the optical analysis to obtain the index of refraction anywhere in each lens. This method has greater accuracy compared to the OPD integration method but is significantly more computationly intensive. Figure 4 – The user defined gradient index method of thermo-optical analysis generates a database of the three-dimensional refractive index profile accessible by optical analysis software during ratracing through a Sigmadyne supplied dynamic link library. Similar to thermo-optic analysis stress-optic analysis predicts the optical performance due to average refractive index changes caused by stresses in transmissive optics. 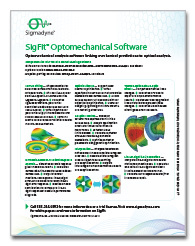 SigFit uses the stress results from finite element analysis in combination with stress-optic properties to compute OPD maps by the OPD integration method. No optical analysis software will support a user defined gradient index lens representing stress-optic refractive index profiles so only the OPD integration method is available for stress-optic analysis.